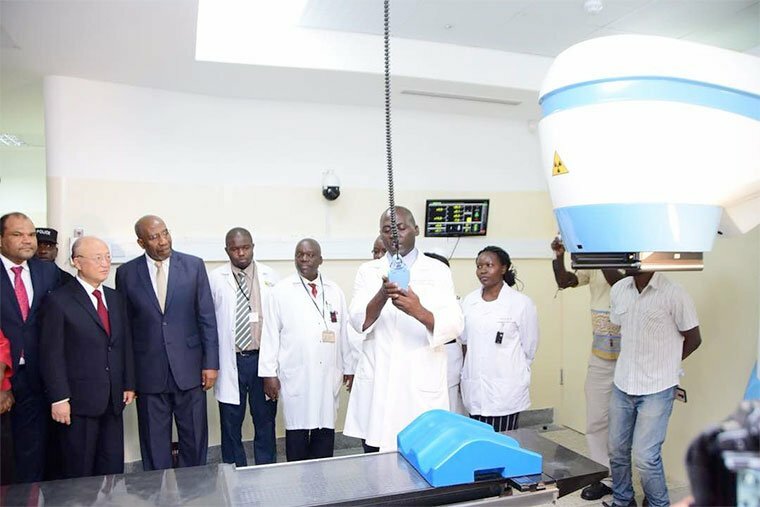 Prime Minister of Uganda Dr Ruhakana Rugunda has today (Friday 19 January 2018) commissioned the New Cobalt 60 cancer Radiotherapy Machine at Mulago Cancer Institute in celebration of World Cancer Day. Also present was Amb. Yukiya Amano the Director General of the International Atomic Energy Agency (IAEA) and Health Minister Ruth Aceng among others. It will be remembered that the old cancer machine, which was handling over 17000 patients each year, broke down in March 2016 and had been installed 22 years ago. It was for this reason that the new machine machine was procured from UJP Praha, a multi technology company in Czech Republic, that deals in nuclear, industrial and medical equipment. It is said to have cost €664,830 with half of the money being a contribution from (IAEA). The machine was delivered at Mulago in August 2017 upon completion of the construction of the bunker that was supposed to house it. It was then installed and tested before the commissioning. The commissioning of the new cancer machine gives hope to cancer patients in the country that are referred to the Uganda Cancer Institute for treatment. Dr Daniel Kanyike the head of the radiotherapy department at Mulago, says 80 patients are attended to per day and they suspect the number will increase after the commissioning today.